The rivers in Montana offer superb trout fishing and a chance to float through wild, scenic terrain. Less known is how effective the rivers are at destroying electronics—particularly mobile phones. Since many Montana visitors end up “on the water” during their trip, whether to fish or raft on a recreational float trip, that many expensive smartphones have experienced premature deaths isn’t surprising. Water and smartphones are a poor mix. Unless the mobile phone is protected, in a contest between water and mobile phones the water usually wins. To help prevent the premature death of expensive smartphones owned by Montana visitors, I’ve prepared this article. The article’s purpose is to suggest various methods—and the gear needed—to help Montana visitors protect their phones and other electronics from unpleasant “accidents” while fishing or floating. Before diving further into how to protect your phone on a floating or fishing trip, let’s first discuss the obvious way to protect your phone from any possible water damage. The absolute best method to protect your phone is simple to achieve and costs nothing. This method, of course, is to leave the phone at home—or at least in the car. Of course, today’s modern world often prevents people from utilizing this method. In short, there’s nothing wrong with taking a mobile phone on a fishing or floating trip. Indeed, for any overnight trip, or day trips that pass through remote areas or areas with significant whitewater, leaving the mobile phone behind is a poor, and potentially dangerous, option. How this system works is simple. 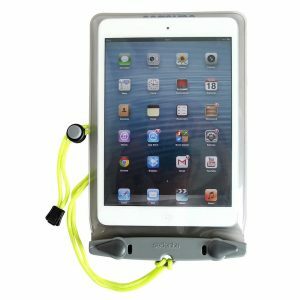 Use the dry bag to store your phone and other essentials (such as purses, car keys, and wallets). Close the dry bag tightly by wrapping the opening at least three times before buckling it shut. Marine rope, which is used to secure the small dry sack to your boat. More marine rope at NRS. Use the rope and carabineers to connect the dry bag to the raft, kayak or whatever fishing boat you’re using. This way, if the boat flips, your phone and other essentials won’t disappear down the river. By using this method, the floater always has their phone with them. The dry bag prevents water from reaching the phone, regardless of weather or water conditions. And should the boat flip, the dry bag itself won’t float away since it is secured to the boat by the rope. I’ve used this simple method for years without destroying any electronic devices or phones, and highly recommend it. Moreover, a small dry bag is large enough to store other essentials, such as car keys, wallets, purses, digital cameras and other small electronic devices. By using this method, floaters can protect all their essential gear. Now, if you need to use your phone, just find some shallow, slack water (where there’s no current or whitewater), then carefully open the dry bag and pull out the phone. When finished, put the phone back in the dry bag, close the top and you’re ready to resume the float trip. But what if you want to use your phone while out in the middle of a river? Or you want to use the phone regardless of water conditions? Or perhaps you’re expecting an important phone call and won’t have time to “pull over” to the nearest slack water? Well, if you fit this category, then let me suggest the following system. First, you’ll want to buy the three above mentioned items (small dry bag, marine rope and two carabineers). In addition, you’ll want to purchase what’s known as a waterproof phone case. Waterproof phone cases allow for partial to full use of phones, while still protecting the phone from water. All good waterproof phone cases also come with a short lanyard. The purpose of the lanyard is to keep the phone attached to either you or something else, so as to prevent the phone from disappearing into the water depths should the boat capsize. Generally, most people attach the lanyard to their life vest or fly fishing vest. If you buy a waterproof phone case, you might wonder why I also suggest buying a dry bag, the marine rope and two carabineers. Well, it’s simple. Even if your phone is protected by a waterproof phone case, you still need a small bag to store essentials like purses, wallets, money, cameras and car keys. Additionally, the dry bag makes a handy place to toss the phone when you’re done using it and provides additional protection. Dry Bag Color – For simplicity, buy a clear dry bag. Clear dry bags make finding items much simpler. Yes, You Want Marine Rope – Don’t skimp on the rope. Buy marine rope. Marine rope is much sturdier, resists rot and mildew, floats and is also soft to the hand. The rope is also thick, allowing for easy handling. Marine rope is rarely sold in stores, so you’ll need to buy it by the foot at NRS. Offline, sporting good stores that sell technical gear, such as REI and Eastern Mountain Sports, generally have a small selection of dry bags and waterproof phone cases. However, it’s been my experience that XS dry bags are often difficult to find in stores. Online, the first place to shop for waterproof phone cases and dry bags is NRS.Com. NRS has, by far, the widest selection of quality dry bags and waterproof phone cases. 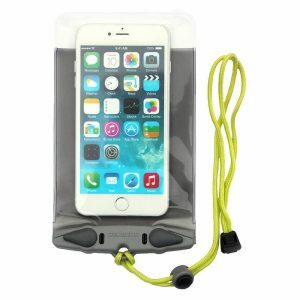 Amazon – Sells a wide variety of dry bags and phone cases. Most dry bags are good quality, but some waterproof phone cases lack, well, “waterproofing.” If you buy a waterproof phone case at Amazon, be sure to read the reviews.